Earth Two. A new home for the survivors of the fleet, the men and women who battled against seemingly insurmountable odds to survive the assault of the First Imperium and to destroy the homicidal Regent, the artificial intelligence committed to their destruction. They have prospered in the years since their arrival, adapting the technology of the First Imperium to build a new and prosperous republic. But as the fear of the First Imperium recedes, cracks have begun to appear, conflicts looming that threaten to destroy all they have worked to achieve. There are rivalries between the clones known as Tanks and the NBs, naturally born humans - disputes driven by envy, resentment. And on the fringe of the new society, the enhanced genetic hybrids known as Mules are feared by both groups, though they continue to decipher First Imperium technology for the benefit of all. But there is a far greater threat lurking in deep space, for the Regent was one of two, and its copy activated automatically upon its destruction. It has been planning, exploring, building vast fleets of new warships, and now it is ready to strike at a divided republic, to accomplish what the Regent failed to do. It is ruthlessly single-minded, existing for a single purpose. And that purpose is vengeance. ©2016 Jay Allan Books Inc. (P)2016 Audible, Inc.
the editing cut off words so much and often it was very distracting. the performance was great but the bloody editing was really freaking annoying. Once again an amazing story! But the editing was really bad. Lots of words were cut of and several sentences were repeated!! This is not his best work. No big space battle. 25 year later??? Too big of a gap too many questions. Seems the author didn't have enough material for a full book so spent most of the time with the same detailed descriptions over and over of characters past accomplishments or history. Well, he doesn't repeat as much. Set about 30 yrs after the last story, we find a thriving yet divided people doing what humans do best, arguing. But threats still prevail that may yet threaten their servival. The story was good enough to keep me interested and the repeating of points endlessly was kept to a minimum. He decided to introduce a gay couple into the mix that to me seemed nothing more than a distraction from the story and just not needed which made me wonder if he was checking boxes, for that reason alone I gave it a lower score. The production value is horrible, it brings the whole book down. Who ever did the editing has a lot to learn! 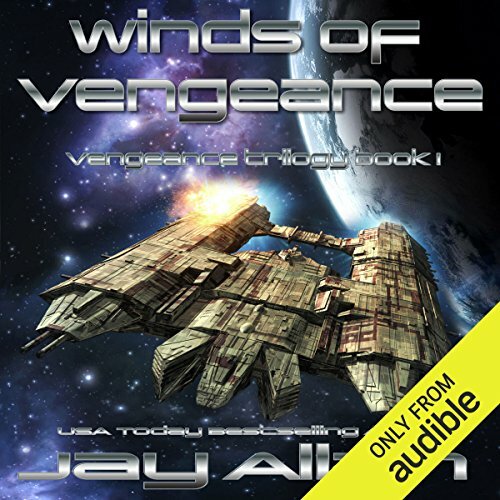 Winds of Vengeance is Jay Allan's 4th installment in the Crimson Worlds Refugees series. The story picks up 30 years after the contingent has established Earth 2. With three decades of relative peace, the colony has sufficiently grown to begin to experience societal variations that are coming into conflict with one another in the absence of strict military conduct and control. At the same time, a backup plan for vengeance by the defunct Regent is coming to fruition. While there has been much incorporation of 1st Imperium technology, it's been largely incremental (faster ships, more powerful weapons, etc.). The major new sci-element is the introduction of human genetic engineering to create what amounts to two new distinct groups, the tank borne which have inherent defects repaired, gestated in an artificial womb, but have become susceptible to a unknown terminal disease, and a small group of "super" humans who have 1st Imperium genes spliced into their genomes making them super smart and super tough. The constant reference to "anti-matter" technology hints at the eventual winning strategy. Overall, the tale is underwhelming relative the standalone trilogy. The Regent's revenge plan is basically son of Regent with similar types of engagements and outcomes. In addition, there are entirely too many monologues and soliloquies with multiple characters excessively ruminating about how they aren't able to live up to the older generation that defeated the Regent. All in all, it comes off more as Regent round 2, rather than the next adventure. Finally, there is a conflation between machine intelligence and artificial intelligence. The Regent and his backup plan should be regarded as machine intelligence due to implied programming limitations demonstrated as an inability to consider any alternative approach. This manifests as a single course of action that is pursued: kill all humans. At the same time, there is a bit too much anthropomorphism with human style frustration along with an introspective style of self reflection that implies an artificial intelligence. The narration is well done with a decent range of voices of both genders. The pacing is in line with earlier installments. 3 sur 6 personne(s) ont trouvé cet avis utile. What would have made Winds of Vengeance better? Would you ever listen to anything by Jay Allan again? Which character – as performed by Jay Snyder – was your favorite? What character would you cut from Winds of Vengeance? almost all of the drivel, the clones, the tanks, the MBs? Cloning is a controversy not needed in this SiFi world. Technically, a clone could never be extinct if they can be grown in a tank at any time; therefore, the "Mule's" arguments are moot and a diversion from the main story.